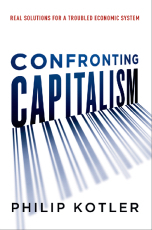 A sweeping analysis of capitalism's challenges -- and a bold new direction for the future. With the fall of the Berlin Wall, one economic model emerged triumphant. Capitalism -- spanning a spectrum from laissez faire to authoritarian -- shapes the market economies of all the wealthiest and fastest-growing nations. But trouble is cracking its shiny veneer. In the U.S., Europe, and Japan, economic growth has slowed down. Wealth is concentrated in the hands of a few; natural resources are exploited for short-term profit; and good jobs are hard to find. With piercing clarity, Philip Kotler explains 14 major problems undermining capitalism, including persistent poverty, job creation in the face of automation, high debt burdens, the disproportionate influence of the wealthy on public policy, steep environmental costs, boom-bust economic cycles, and more. Amidst its dire assessment of what's ailing us, Confronting Capitalism delivers a heartening message: We can turn things around. Movements toward shared prosperity and a higher purpose are reinvigorating companies large and small, while proposals abound on government policies that offer protections without stagnation. Kotler identifies the best ideas, linking private and public initiatives into a force for positive change. Combining economic history, expert insight, business lessons, and recent data, this landmark book elucidates today's critical dilemmas and suggests solutions for returning to a healthier, more sustainable Capitalism -- that works for all.